UK: J.M. Dent & Sons Ltd., 1917. Hardcover. Good. The Temple Press. 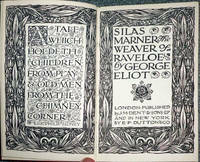 Woodblock printing to title pages. Olive cloth boards with gilt decoration and lettering to spine. Gilt decoration to spine is fading.Spine has a light crease. UK: J.M. Dent & Sons Ltd., 1914. Hardcover. Very Good. The Temple Press. 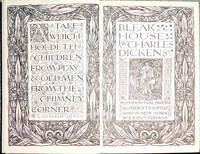 Woodblock printing to title pages. Green cloth boards with gilt decoration and lettering to spine. Light rubbing, a tight and clean copy. UK: J.M. Dent & Sons Ltd., 1912. Hardcover. Good. The Temple Press. Woodblock printing to title pages. Black cloth boards with gilt decoration and lettering to spine. Split front hinge and loose front gutter. UK: J.M. Dent & Sons Ltd., 1910. Hardcover. Very Good. 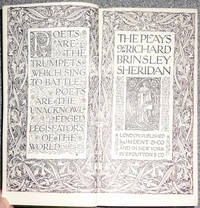 Printed by Richard Clay & Sons . 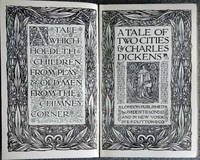 Woodblock printing to title pages. Brown cloth boards with gilt decoration and lettering to spine. Tight and clean copy. UK: J.M. Dent & Sons Ltd., 1912. Hardcover. Very Good. The Temple Press. 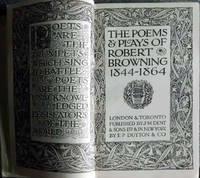 Woodblock printing to title pages. Red cloth boards with gilt decoration and lettering to spine. Light rubbing, a tight and clean copy. UK: J.M. Dent & Sons Ltd., 1000. Hardcover. Good. 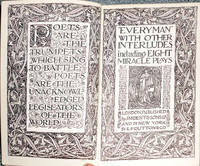 Undated circa 1912-1917 The Temple Press. Woodblock printing to title pages. Grey cloth boards with gilt decoration and lettering to spine. Tight and clean ncopy. .
UK: J.M. Dent & Sons Ltd., 1932. 2nd Edition . Hardcover. Very Good. 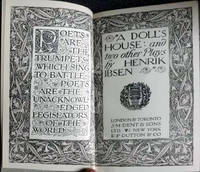 The Temple Press Woodblock printing to title pages. Olive cloth boards with gilt decoration and lettering to spine. Light rubbing, a tight and clean copy. Cassell and CompanyLtd, 1931. 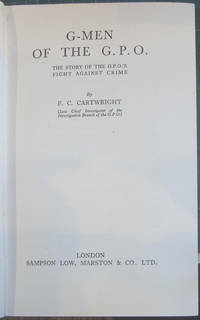 1st Edition . Hardcover. Very Good/No Jacket. 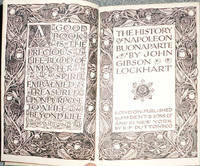 H/B 316 pages, condition is very good, navy boards with gilt lettering to the spine. No DJ. UK: J.M. Dent & Sons Ltd., 1912. Hardcover. Very Good. The Temple Press. Woodblock printing to title pages. 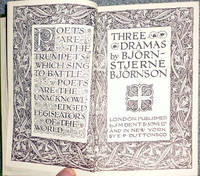 Black cloth boards with gilt decoration and lettering to spine. Light rubbing, a broken rear hinge. UK: J.M. Dent & Sons Ltd., 1912. Hardcover. Very Good. The Temple Press. Woodblock printing to title pages. Red cloth boards with gilt decoration and lettering to spine. Tight and clean copy. UK: Sampson Low Marston & Co Ltd, 1938. Hardcover. Very Good. 6" x 9. 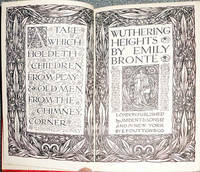 H/B 246 pages, condition is very good, the red boards are worn and slightly dirty. A roll to the book. No DJ. 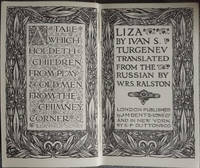 By Turgenev, Ivan S.- W.R.S. Ralston Trans. UK: J.M. Dent & Sons Ltd., 1000. Hardcover. Very Good. The Temple Press. Woodblock printing to title pages. Red cloth boards with gilt decoration and lettering to spine. Light rubbing and soiling to front board., a tight and clean copy. UK: J.M. Dent & Sons Ltd., 1000. Hardcover. Very Good. 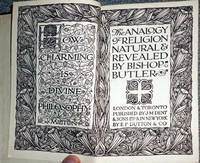 Undated, circa 1910-1918 The Temple Press. Woodblock printing to title pages. Red cloth boards with gilt decoration and lettering to spine. Light rubbing. Tight and clean copy. .
UK: J.M. Dent & Sons Ltd., 1000. 2nd Edition . Hardcover. Very Good. 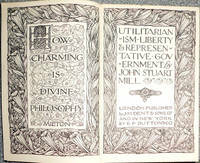 Undated circa 1912-1917 Temple Press. 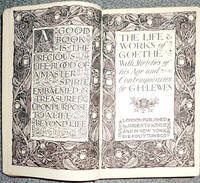 Woodblock printing to title pages. Green cloth boards with gilt decoration and lettering to spine. Light rubbing, a tight and clean copy. UK: J.M. Dent & Sons Ltd., 1906. 2nd Edition . Hardcover. Very Good. 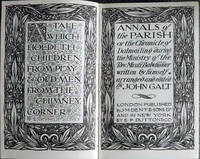 Woodblock printing to title pages. Green cloth boards with gilt decoration and lettering to spine. Light rubbing, a tight and clean copy. Owners signature on free end paper. UK: J.M. Dent & Sons Ltd., 1913. Hardcover. Good. The Temple Press. Woodblock printing to title pages. Red cloth boards with gilt decoration and lettering to spine. Weak joints. UK: J.M. Dent & Sons Ltd., 1911. Hardcover. Very Good. 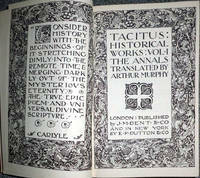 Printed by Ballantyne, Hanson & C0. Woodblock printing to title pages. Wine limp leather boards with gilt decoration and lettering to front board and spine. Slight wear to top and tale of spine and some rubbing to corners. UK: J.M. Dent & Sons Ltd., 1912. Hardcover. Very Good. Temple Press. 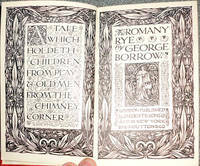 Woodblock printing to title pages. Grey cloth boards with gilt decoration and lettering to spine. Tight and clean copy.